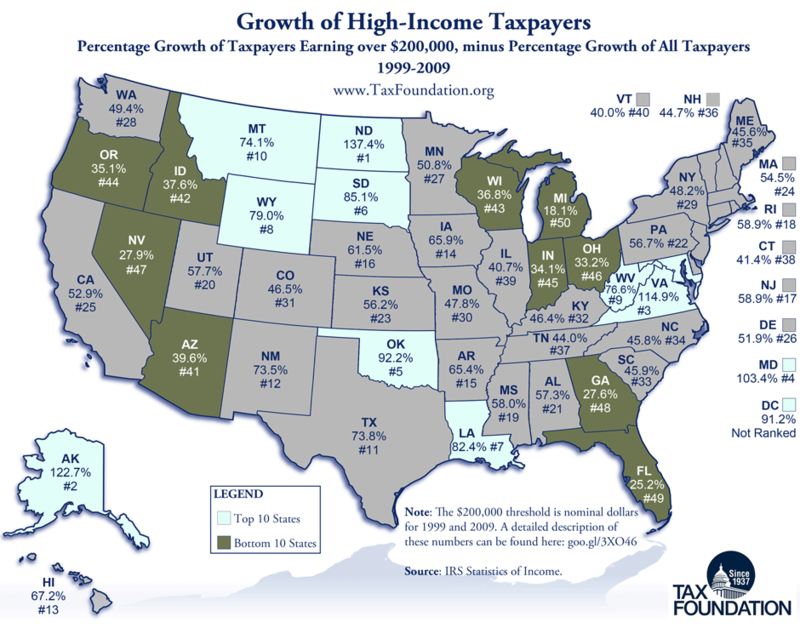 This map shows percentage growth of taxpayers earning over $200,000, minus the percentage growth of all taxpayers, over the decade-long period from 1999 to 2009. The $200,000 threshold is in nominal dollars, so all states will have had considerable growth, but the differences between the states demonstrate that certain states have had much stronger increases in wealthy taxpayers than others. North Dakota takes the top spot—returns with AGI over $200,000 increased 144.53%, while all returns increased only 7.1%—a considerable difference of 137.4%. Michigan is last—returns over $200,000 increased only 17.6%, while total returns actually decreased by 0.5%, for a final difference of 18.1%. To see the raw data, visit this page. For previous Monday maps, click here.